BROSSARD – After wrapping up a successful college hockey career at the University of North Dakota, Mark MacMillan is ready for his shot at the pros. MacMillan, who signed a two-year entry-level contract with the Canadiens on April 12, is among dozens of prospects and invitees strutting their stuff at Development Camp through Thursday at the Bell Sports Complex. It’s the sixth time the 23-year-old Penticton, BC native has taken part in the annual summertime affair, but with a new chapter on the horizon, MacMillan is more eager than ever to demonstrate just how far his game has come over the last four years. “I just want to showcase what I can bring to the table. I take a lot of pride in being a two-way player that can play at both ends of the rink. I’d like to showcase my character and my compete level. I think those things make anybody successful at any level. Whether I’m in the American Hockey League or the National Hockey League, that’s what I’m all about. Obviously, the ultimate goal is to play in the NHL. That’s every kid’s goal. Right now, I want to come in, play like I can and be myself. I think pretending to be someone else gets you in trouble. That’s the biggest thing,” offered MacMillan, who registered 46 goals and 99 points in 151 career games for the seven-time NCAA champions between 2011 and 2015. Unfortunately, MacMillan isn’t able to scrimmage right now after suffering a fractured knee cap while blocking a shot against St. Cloud State University on February 28 in Grand Forks, ND. That sidelined the former BCHL standout for the remainder of the season, including North Dakota’s magical run to the 2015 NCAA Frozen Four. The 6-foot, 183-pound centerman isn’t dwelling on that disappointment now, though, focusing instead on getting his pro career started on a high note. “This is all about getting a new opportunity. I think it’s very cool that I went to North Dakota, which is probably the most storied franchise in college hockey, and now I’m coming into the most storied franchise in the NHL. Just being a part of that pride in North Dakota, I think it’s something that I can carry over to being a Montreal Canadien and being a part of the organization. I’m really proud and excited about it. I think turning the page is about being excited, but not over-excited, and doing what I can on the ice to help my team win,” shared MacMillan, who served as North Dakota’s assistant captain in 2014-15. That certainly includes learning from the likes of players who boast qualities like a relentless work ethic, fearlessness, ferocity and an insatiable desire to win. 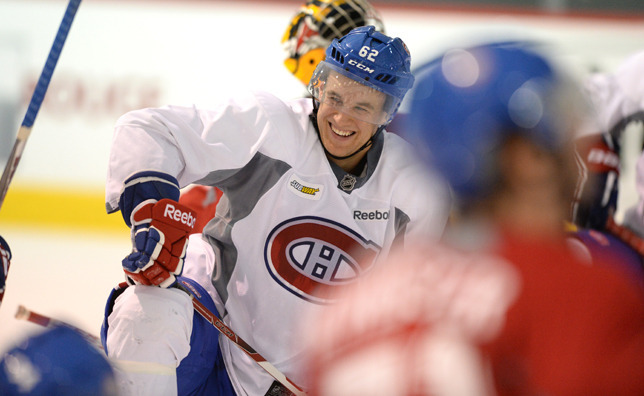 In MacMillan’s case, that role model just happens to be long-time friend, Brendan Gallagher. While MacMillan certainly enjoys lighting the lamp, he prides himself on defense, too. It’s one aspect of his game that has come a long way over the last few years, so much so that it earned him NCHC Defensive Forward of the Year honors this past season en route to helping North Dakota claim the outright NCHC title. Now, MacMillan is chomping at the bit to put those talents to use at the next level.